A 3-day course on Tuberculosis (TB) was held in Amsterdam on 22-24 September 2014. 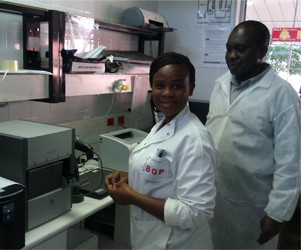 The course offered the opportunity to access up-to-date knowledge in the field of clinical TB. International training on TB drug management and quantification. The 41th meeting of the Tuberculosis Surveillance and Research Unit (TSRU 2016) will be held from Monday 4 to Wednesday 6 April in London, United Kingdom. 7th Union Conference on Lung Health of the European Region, 22-24 June 2016, Bratislava, Slovakia. KNCV will contribute to several symposia. As the world’s leading TB expert organization, KNCV Tuberculosis Foundation will have a significant presence at the 48th Union World Conference in Guadalajara. Ministers, leaders of UN organizations, NGOs, civil society, academia and the corporate sector, will gather in Moscow on 16-17 November 2017 at the first WHO Global Ministerial Conference to end tuberculosis (TB). Op maandagmiddag 20 november vindt het eerste Global Health Café plaats in het Koninklijk Instituut voor de Tropen. Onder leiding van moderator Petra Stienen gaan interessante buitenlandse en Nederlandse gasten vanuit civil society, faith based organisaties en overheidsperspectief met elkaar in gesprek en debat over het thema zorgpersoneel. On Monday 20 November 2017 the first of a series of four Global Health café debates will be held at the Royal Tropical Institute (KIT) in Amsterdam. Hoe richten we de gezondheidszorg in op een wijze zodat ze optimaal benut kan worden door adolescenten? Deze vraag staat centraal in het tweede Global Health café op vrijdagmiddag 16 maart in het Humanity House in Den Haag. How can we design healthcare systems in such a way that it will be used to its fullest effect by adolescents? This question will be center stage in the second Global Health Café that will take place on Friday 16th of March in the afternoon in the Humanity House in The Hague. Financing health, how do we do this? What is Universal Health Coverage, and what is the best way to achieve this? These questions and more will take center stage in our next Global Health Café. The International AIDS Conference is the largest conference on any global health or development issue in the world. The UN High Level Meeting on TB marks a critical moment to drive delivery of political commitments. Heads of State will gather in New York on 26 September this year at the United Nations General Assembly first-ever high-level meeting on tuberculosis to accelerate efforts in ending TB and reach all affected people with prevention and care. The theme of the meeting is “United to End tuberculosis: an urgent global response to a global epidemic”. Nurses have a vital role worldwide in the care and treatment of tuberculosis (TB). To highlight this important role, a symposium side event is being run during the 49th Union World Conference on Lung Health. Deze meeting is een vervolg op eerdere succesvolle meetings over inhalatie van anti-TBC middelen. Dit gaat van formuleringen van de medicatie tot de klinische toepasbaarheid. Ditmaal vindt het plaats in Groningen.